"I know it sounds weird. . . apples and lentils? But it's a delicious, light, and healthy soup. Serve this with some homemade bread, a salad, and it's a meal. This is a regular at our family table; I hope you like it." Heat olive oil in a large pot over medium heat until hot; stir in onion and apples and cook and stir for 4 minutes. Stir flour into apple mixture; cook and stir for 2 minutes. Whisk chicken stock into apple mixture; bring soup to a boil. Stir lentils and celery seed into soup; return mixture to a boil, reduce heat to low, and simmer until apples are tender, about 45 minutes. 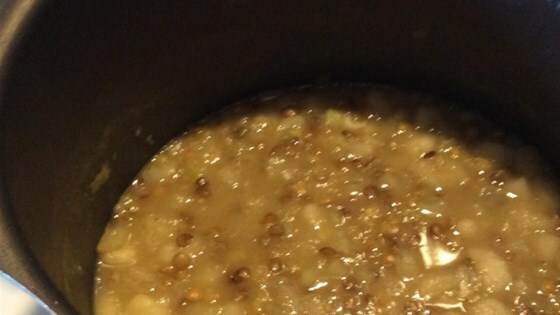 See how to make a simple, traditional Greek lentil soup. One cup dry lentils can be substituted for canned lentils; cook until lentils are tender, adjusting cooking time as needed. Skipped the celery had none. Added hot pepper flakes to each individual bowl. Yum. Great soup for the cold winter nights in Wisconsin. Will make again for sure.